I was supposed to be a quiet family morning at church for one happy family, but little did they know that the topic of today's sermon... was murder! Actually, that's not right. That intro makes it sound like there's a killer priest on the loose, when that's just not the case. Unless, in addition to the guy actually running things at the altar, there's a second priest who sneaks into the back of the church and slashes a random husband and father's neck. Two surprising things here - 1: I'm a little shocked that he's killed by the injury - yes, a slashed throat is bad, but it's not like it was a deep cut, and there's almost certainly a doctor somewhere in the room. 2: No one rushes out of the church to chase after and identify the killer. I mean, people confronted Scott Roeder(sp? ), and he had a gun. Sure he got away, but plenty of people saw him, yet we're meant to believe this guy slipped out like a ninja. 'Could be'? Come on, Greg - he's just brutally slashed the throats of three people in two weeks. How is this not already a spree? Hopefully he'll have some justification to offer after the opening credits. On the plane the team offer some fun facts about spree killers, but it's all wikipedia-grade stuff, and not really the kind of thing that could help them solve a crime. Oh really, so he'll lash out at any perceived slight? I guess we'd better tell the people of Providence, RI to all start being super-nice to each other! 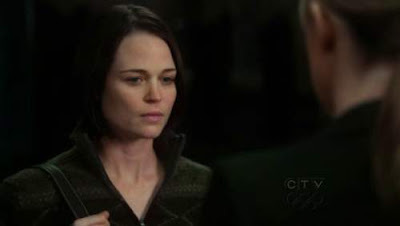 When they arrive the team splits up and heads to the various crime scenes, while Reid and Greg drop by the police station. This leads to a weirdly out-of-character moment from Reid when the detective in charge of the case asks if there's an area they should double patrols in. Reid claims that it's 'too early' to offer one of his classic geographic profiles, which I have to call nonsense on. Why? 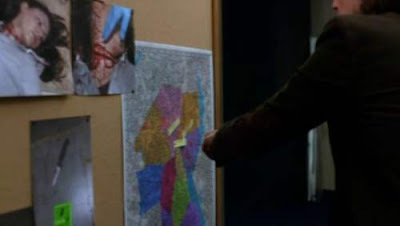 Because in every other episode Reid has told us that he just needs three points on a map to work up the profile. Here's the map they're working with. Please note the three marks within a 1-inch radius. I may not be a profiler, but I'm fairly sure the guy lives/works in or near the area, and will probably kill there again. There's an abortive murder attempt that afternoon, when the killer tries to murder a woman at a bus stop, but her bus arrives before he can do the deed. Will she ever realize how close she came to death? Probably not. Over at the latest victim's house the family is having a hard time dealing with all the press attention after the soldier's death. It's a sad situation and all, but not really relevant to catching the killer. All they learn is that the killer entered while the family was walking to get communion. During this whole scene they're acting like this is the first time the widow has told this story, which seems like a stretch. I mean, if the team was already in town after the first two murders, and they were primarily investigating this case, fine, but shouldn't she have already gone through this like six times? JJ offers to stay at the house with the widow to talk her through all this stress and heartache - which is nice and all, but doesn't the city have counselors for that kind of thing? This is a high-profile, media-intensive murder case. Something tells me your 'talents' will be better used dealing with the demands of the press? It seems Joe and Emily have been more productive at their crime scenes: noticing that each was an institution, and has become something of a shrine to the victims (at least the latest one), he surmises that the killer may be attacking the neighbourhood in Providence itself! Which, again, suggests that doubling patrols around there would be a great idea. Of course, it's doubtful how much use the police are going to be, when it turns out the killer works in a diner that cops frequent! Wait, if the killer is getting off on seeing the reaction that people have to his crimes, wouldn't overhearing cops talk about his sensational murders be enough for him? Why would he also need to commit them in public places so that there could be crowds of people gathered around? Unless the threat of getting caught (which is all but inevitable, given his MO) is part of the thrill, I don't know what this guy is doing. Here's another lead that was mentioned, then immediately dropped as 'insignificant': he leaves his knife at the crime scene, and it's always the same kind of knife - the team dismisses it because you can buy those knives at any surplus store. Which may be true, but how many surplus stores are there in the neighbourhood where he lives and kills? Have you shown the picture to all the people who work in those shops? Looked at their records to see who bought those knives and when? What's that? The show is too busy showing JJ having a tea party with the little girl to bother with actual investigation? Oh, that's fine then. My fault for asking, really. Time for the profile: according to the team, this guy profiles like an arsonist! Wait, what? Oh, okay, they're saying that he kills people for the thrill he gets watching the public react, not because of any particular problem he has with that person. Doesn't that mean he's profiling more like a terrorist than an arsonist? Also the team mentions that arsonists burn down places with some significance to them, which is just plain idiotic - unless abandoned buildings get on a lot of people's nerves. Seriously, the Son of Sam reportedly set 2000 fires before upgrading to murder - are they suggesting that all those trash cans and crumbling tenements had some personal meaning to him? Or is it just more likely that he enjoyed watching things burn and seeing the people make a fuss over his work? Speaking of making a fuss, there's a murder down at the local farmer's market - once again in broad daylight, and once again somehow no one sees him despite his lack of a disguise or anything like that. Everyone rushes to the crime scene, and the police are ordered to cordon the place off so that the killer, who is likely to stick around and watch, will be easily catchable. The plan goes awry because of the killer's familiarity to the police, however - when he tries to sneak out he's spotted by someone he knows. The cop lets his guard down, though, which leads to a quick stabbing, then a guy fleeing for his life! The aftermath of the dead police officer is flatly ridiculous, with the team feeling the need to explain his motivation for the crime to the other cops, as if 'he didn't want to get caught' is somehow a complex concept requiring clear deliniation of all its facets. They also want to ensure that the media doesn't cover the officer's death too heavily. Why? It seems that if the killer doesn't feel like he's getting enough attention, he'll lash out and kill more! Um... isn't he going to do that anyhow? They also plan to lay a trap for the killer - since he's trying to depress the neighbourhood, maybe if they show that the neighbourhood has been strengthened by the attack, he'll go after the same target again! There's a hitch in the plan, though - the widow won't go along with making a speech and drawing the killer's ire. Ridiculous contrivance brings the team their next lead, as Joe and Greg ponder just why the killer hasn't gone out and killed again, since he can't possibly be getting the vicarious thrill from killing that cop. The only possible conclusion? He's feeding off the grief of police officers: so he must be hanging around/work in an establishment that cops frequent! Which is a nice theory, and an accurate one, except for one thing - how is killing a cop not high-profile enough to get him a vicarious thrill simply through the media coverage? A serial killer slashed the throat of someone in the middle of a crowd, and then killed a cop while making his getaway. This is all the media should be talking about on every channel, all the time. The idea that he'd have to actually hang out with cops to soak in a city's grief is flat-out absurd. 15+ knives stashed in a drawer. Really seems like it would be hard to buy that many knives without someone noticing, doesn't it? That is just an ample supply of knives. How long did he have this planned? Apparently not very long - they announce that he started killing because his dad's sentence was suddenly reduced just a month earlier, meaning that he stockpiled all those knives in two weeks. Also, are we supposed to believe that this guy hasn't been killing all along? They've been comparing him to an arsonist all episode, talking about his patience, and planning, and how he'll move on if the circumstances aren't just right - so how did he get so good at killing people? You don't just wake up one morning with the skills necessary to kill someone in public and then disappear without being noticed (if that's even possible). Arsonists start dozens of fires before they're any good at it - where's this killer's similar history of escalating violence that substituted for the fires he wouldn't let himself start? Shouldn't this cat have already been extremely well-known to the police? Where was I? Right, the killer murders someone in a library, then flees again. Three attacks this week - that's a twist! When the killer flees right after the murder, the team develops a plan - lie and say that the latest victim is still alive, and then wait for the killer to show up at a candlelight vigil being held for her at the hospital! Also along to help, the widow from the beginning, who's waiting for them in the police station as they walk out. Wait, what? The scene opened with the detective in charge of the case hearing about the slashing and telling the team. According to him the paramedics were still there with the victim. This is like ten minutes, tops. So how on earth could the widow have heard about this latest death, let alone swung down to the police station to offer her help? Hold on a second... weren't they also in Rhode Island when that little girl teleported to the police sation from San Diego? Are the Rhode Island police stations Narnia, and you can get to them through every closet door? You know, it's going to be really embarrassing when I go back later to check and discover that the Bill Sadler episode took place on Long Island or something like that. In an amazing coincidence, the killer happens to be walking by a corner store when the fake news report is being broadcast, allowing him to hear about the fake vigil. Although you'd think he'd get caught a little sooner, since the news report really should have featured a picture of the killer's face (which they had), leading the guy in the corner store to call the police. Hell, even if he didn't see the mug shot that's on file, shouldn't the clerk have grown suspicious when, after the report announced that the victim was being rushed to the hospital, the killer exclaimed "No! That's not possible!" I've got to say, if I was ever in that position, I'd be on the phone to the cops the moment that guy was out of earshot. So anyhow, the killer goes to the hospital, and he's immediately captured without incident. Oh, except for a scene where he winds up in prison with the father he hates, so he's able to stab the guy to death. 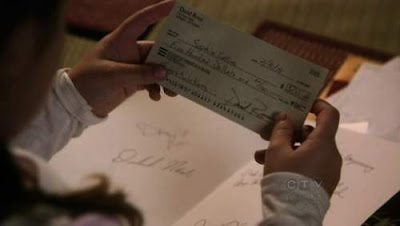 Also, Joe sends the little girl a five hundred dollar cheque for her first communion. There absolutely was psychological insight required to predict the killer's behaviour, and the analysis that he would go to the hospital was dead on. Of course, I can't give them full credit, since the underlying concept, that a guy who wanted to commit arson was slashing people's throats instead, makes so little sense that it should just be outright ignored. Did the show yet again tiptoe their way around doing an episode about an arsonist because arsonists are impossible to catch? Yup. That's exactly what they did. I literally have no idea how the shifty nervous guy with no military training was able to kill all those people without being noticed by anyone. Could he have killed that first person, maybe even the second? Sure - but there's no way the cops wouldn't have gotten him right afterwards. 4/10 - You know, when Luther did this exact story in season 2, it was way better handled. Just saying. Also, if ever you wanted proof that the show wasn't shot on location, here's what February in Rhode Island apparently looks like. Please note the lack of snow. Or coats. 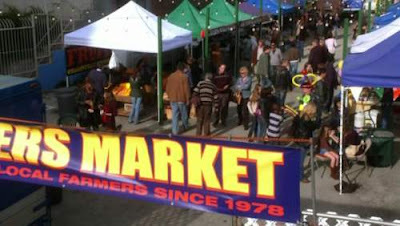 And the fact that there's a farmer's market going on and people are in shorts. February. Rhode Island. Ya know, it's a free country, but I'm completely puzzled as to how you developed a fondness for this show. You don't seem to like anything about it, and you say it's too bland even to be funny, so what's the attraction? It's not that complicated a story - I tuned in to the first episode because I'm a big fan of Mandy Patinkin, and I find Greg to be a likable presence in just about anything. Unimpressed by it, I didn't watch another episode. Years later I had a hypothesis that not only had profiling never been used to catch a serial killer, but the idea of it is so absurd that even people writing a show about profilers wouldn't be able to craft situations where it was employed to any effect. I picked criminals minds to test this hypothesis because, as a show currently on the air and available on DVD, it would be easier to track down than episodes of 'Profiler'. While most of the show is merely bland, I am also excited to watch it because every now and then it features content so bizarre and inept that I wind up agape that it was allowed on television. Like having the wrong actress read lines in 301, or the Reaper's plan in 508, or the entire plot of the cliffhanger/resolution in 523/601 (review coming in November!). Hopefully that answers your question, and thanks for reading. I almost dropped this show when Gideon left, I liked the character and his interaction with the team. Your blog "made me" keep on watching, just so I could watch an episode and come here to read how bad it was. Most of the times, your reviews would make me realize the episodes where worse than I thought. It was a great experiment, I have a lot of time in my hands. This episode made me dropped the show completely. Rossi (or Joe) is a sick maniac. Does he get a hard on just thinking how he could use the victims (dead or alive) to solve the case? How is this okay? I tried to watch as much as I could of this show, but it's just so awful. Guess by S7, you couldn't take it anymore. Don't blame you. Really enjoyed your posts, just don't need them anymore. Thanks for the good times.